The Bulldog is believed to have evolved from the Molossian dog first brought to Britain by Phoenician traders in the 6th century BC. Because of their courage and apparent ability to endure pain, the breed was exploited in the sports of bull baiting, bear baiting and dog fighting. When bull baiting was made illegal in England in 1835 and eventually dog fighting was prohibited, the breed began to decline in numbers. Fortunately, with the beginning of the dog show era, the breed was saved by a group of fanciers determined to preserve the characteristics of the breed and eliminate all fighting and viciousness. Though the Bulldog may appear to be oddly built, each point of his structure was bred into the breed to aid or protect him while attempting to overcome a bull. His general appearance is one of stability, vigor and strength. The Bulldog is calm and dignified with a steady, even disposition. He is resolute and courageous but not vicious or aggressive. He loves people and though his appearance may be somewhat intimidating, he does not generally make a good watch dog. He has a relatively low activity level so adjusts well in just about any environment. His facial structure makes him susceptible to snuffling, snorting and snoring. Today, Bulldogs are successfully competing in Obedience as well as Agility and Tracking, and their calm disposition makes them ideal candidates to work as Therapy Dogs. Elongated Soft Palate — This is the most common breathing disorder. Hypoplastic (narrow) Trachea — The most common signs of a narrow trachea are shortness of breath, gurgling sounds, and/or wheezing. Many Bulldogs live long and happy lives with this condition provided that they are carefully monitored. Pinched Nares (nostrils) — With this condition, the dog’s nares are pinched tight causing insufficient air to pass through the nose. This can usually be corrected with surgery. 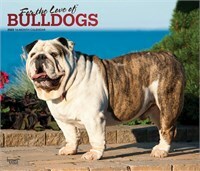 Bulldogs World — Excellent Bulldog information web site.